On the hunt for a luxury sedan that offers equal parts style and comfort at a smart price? Explore the Acura TLX with the Technology Package equipped at Acura North Scottsdale near Scottsdale. We always have rotating vehicle specials on hand to make Acura cars even more accessible! Explore what the Acura TLX Technology Package has to offer in terms of connectivity and infotainment before visiting us for a test drive. Why Choose a TLX with the Technology Package? ELS Studio® Premium Audio System – Make the most of your music in the front and the back seats with this 10-speaker sound system. You’ll get 4 titanium dome tweeters, a 20 cm subwoofer, and DTS® Neural Sound™, which features multi-channel surround sound technology. Additionally, you’ll get Bluetooth™ audio streaming, HD Radio™, and SiriusXM™ Satellite Radio with this system. Advanced Navigation System – Making your way through Phoenix is simple with turn-by-turn navigation via Acura’s intuitive navigation system, which also includes a Voice Recognition System and AcuraLink Real-Time Traffic™ and a 3D View map. Driver Assistance Features – The TLX Technology Package adds a Blind Spot Information System (BLIS) with Rear Cross Traffic Alert to the AcuraWatch™ suite of features. Premium Luxury with V6 – When you choose the Acura TLX V6, you’ll get benefits like increased performance output, perforated Milano premium leather upholstery, a rocker panel extension with a chrome trim and a driver’s seat with power thigh extension. Ready to explore the TLX Packages and all that they have to offer? 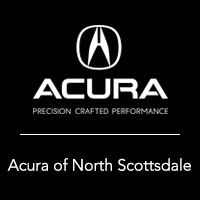 Visit Acura North Scottsdale near Phoenix to walk through the Acura TLX configurations in person. We look forward to helping you find the right luxury sedan for your lifestyle.